14999 10th Battalion Essex Regiment. Percy Outing was born in Little Cornard around 1897. He was the son of Mrs. Beer. In 1901 Percy and his mother were living with his grandparents Robert and Hannah Outing at Railway Crossing Cottage, Little Cornard. His grandfather was employed as a ‘railway platelayer’. His mother later moved to 5 Church Road, Great Cornard. Percy enlisted and served with the Essex Regiment. He is recorded as having first served in a ‘theatre of war’ in France on 18th September 1915. The 10th Battalion formed part of the 18th Division and saw action at the Battle of Albert on the first day of the First Battle of the Somme. The First Battle of the Somme was a series of 12 battles over 141 days from 1st July 1916 to 18th November 1916. Percy was killed in action on 1st July 1916 aged 19. He lies buried in Dantzig Alley British Cemetery, Mametz, France. He was awarded the 1914-15 Star, the British War Medal and Victory Medal. In a hero’s grave he lies. Percy is also remembered on the Trinity Congregational Church Memorial, now situated in the United Reformed Church, School Street, Sudbury and on Little Cornard War Memorial. 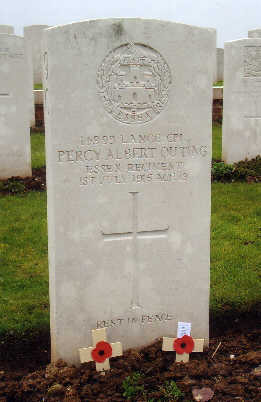 A Cross of Remembrance was laid on Percy’s grave in Dantzig Alley Cemetery on 31st March 2007.